Winter. That time of year when good intentions die the second you put an arm out of the covers. I’m blogging from my phone because I can reach it from bed and type under said covers. When people up north consider moving south. Again.When women stop shaving their legs because no one will see them for six months. When every holiday revolves around food & family. Because who else would go out in the cold to visit with hairy people fattening up for hibernation? And to kick it off a holiday to give thanks. To remind us to stop whining & enjoy our blessings. With the help of thermal undergarments. Several months ago I signed up for National Novel Writing Month. I’d been blogging faithfully for a couple of months and I was ready to push myself to another commitment. November seemed a safe distance away. Surely life would be calm, cool and collected by then and my desk in my office would be cleaned and waiting for a hopeful writer to sit and write. November first came and NaNoWrMo groups launched the activities with write-ins all over the country. I didn’t even have time to blog. My NaNoWrMo began Nov. 6 on a pad of paper with a pen, a way I did not think I was still capable of composing. It has continued with some progress being made every day, although I’m not at 1667 words a day average and I’ve made peace with my NaNoWrMo extending through Christmas. What’s most exciting is that I’m doing it, that my characters on taking on lives of their own and saying and doing things I didn’t expect. They’re waking me up wanting to speak and get on with their lives. It’s invigorating. I don’t expect this novel, if I even finish, to make me famous. It’s enough that’s it’s already making me happy. Thank you, National Novel Writing Month, for giving me a kick in the pants and the courage to sit down and just write. I’ll be back to more regular blogging when it’s over. Twelve years ago I was pregnant and traveling all over Europe doing research. I had three outfits and one carry-on-sized suitcase. I had been travelling for weeks and had acquired some souvenirs and a couple of additional pieces of clothing. My suitcase was bursting. I walked into a German department store and bought an inexpensive black roll away. I still have that bag. The pull-out handle is broken on one side, but the zipper is solid and its black sides look much like they did the day I rolled it out of that department store. It has some scuffs, but they’re war wounds that make me love it even more. Every time I have to jam the broken side of the handle back in or people look at me sideways for using this bag with a broken handle, I glance at my little black piece of luggage protectively. Is this weird? 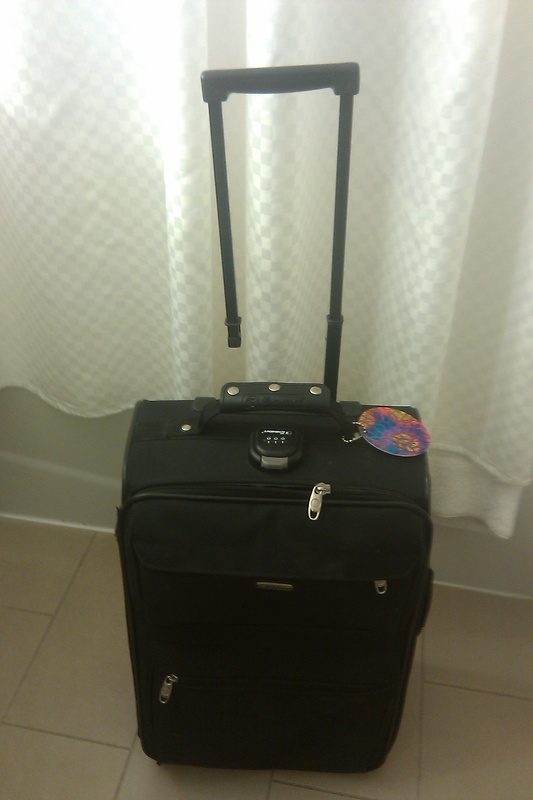 I realized today that I love this little piece of luggage. I will be sad when it finally has had one bounce too many onto a conveyor belt or has been zipped over too-full contents one too many times. How can a person fall in love with a fairly non-descript piece of luggage? Because every time I get it out, I can see that department store with its glass walls and hear its German customers rattling to each other back when I could follow the pace of real German dialogue. I can smell the crisp autumn air in central Germany and see the pollarded trees bereft of their leaves. I can feel my much younger belly taut over my firstborn and feel all of the promise that adulthood spread out before me. I had just travelled, pregnant, young, and female, across Europe with a vague plan, a suitcase, a backpack, and letters of introduction. I had spoken (sometimes mangled) three different languages and maneuvered all types of public transportation systems and cultural traditions. I had slept in places I would never have thought possible, both because they were alley traps and luxurious resorts. I had seen six-hundred-year-old manuscripts and handled four-hundred-year-old printed books that had only been viewed by a handful of people since Europe had its first World War. It had been a hell of a trip and that little black bag became a talisman, a relic, something more than a memento. Because it did not go on a shelf or a wall. It continues to travel, to have experiences of the foreign at my side. And it cost less than $100. That’s a lot of bang for the buck. Love ya, little black piece of luggage, even if the flight attendants and hotel lobby clerks look down their noses at us. Looks don’t make the luggage.